PLAN AHEAD for your breeding to insure your female progesterone is at the proper level for the breeding. This also gives our facility a window of time in which we can insure are Studs sperm count is high, by not breeding to other females closely within your females ovulation period. We like to get 2 ties in a breeding, on a every other day cycle. Normally I can get a breeding while you are at the facility. This is less stressful for your female. If it is more convienent to leave your female at our facility we can accomodate that for our clients as well. If our clients are not here at the time of the breeding,we will take a photo showing the female was bred, along with giving you the time line the animals were tied. Normally our studs ties last between 25 to 45 minutes. We then make sure the female is crated for a few hours. Whether it is here at the facility or back at your home. We don’t want the female to urinate immediately following a breeding and possibily releasing the sperm. We will discuss other important procedures in more detail prior to your visit to insure a healthy,successful breeding. 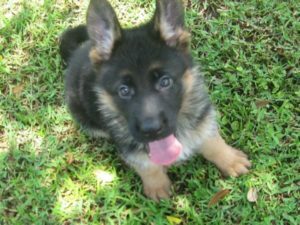 We only breed to approved females, that we feel will produce sound, healthy German Shepherds with good temperaments. Hip certification is required. Import SV Standard for breeding at our kennel is A stamped(exellent) and A1(Good). Less than A1, meaning A2 or A3 will not be bred. In the states I will not breed to less than OFA Good. We feel this is a reasonable standard. 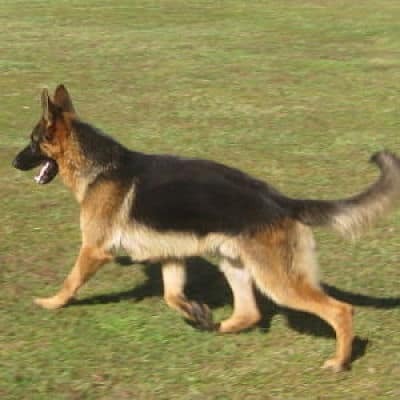 Our goal as a breeder is too improve the breed, not produce German Shepherds with a less than good hip ratings. Utop is a solid black male imported from Germany. His hip and elbow rating is excellent (A Stamped) Utop has very good structure without over angulation. He is large boned, with a massive head. He has great nerves and is a very solid animal. Utops temperament is awesome. He is great with other animals and loves children. 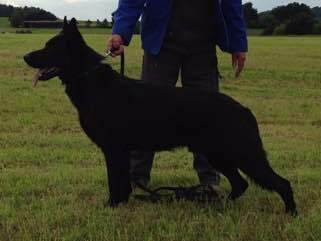 Zucchero is a beautiful black and red male imported from Germany. His pedigree is show lines. He has produced excellent pups in color, structure and temperament. Zucchero has a great personality, he likes other animals and people. But he also will alert and protect in a situation where it is needed.